Version 2.2a allows to activate all cards that either have at least one tag out of a list or all cards that do not contain a tag out of the list. It would be very useful if one could combine several tags (or even several such lists) using Boolean operators. One could then easily activate all nouns in a certain language from specific lessons of a course book, by ticking for instance "noun", "French", "Beginner's Book::42" in three lists and connecting them by the operator AND. Thank you very much for developing and maintaining Mnemosyne. allow pictures imported to a question to resizable. importing a picture is a very useful function as it helps fortify associations with the answer so your brain has more information to draw on while trying to remember/ think of an answer. Although this program does this, the picture imported is always very large. Allow the definition of multi-choice questions which you will find very often for any kind of tests. What colour has the sun? Mnemosyne v.1 play Midi files, and v.2, ¿why not? I suggest to include again this missing and useful feature. 1. Exam mode - unlimited number of reviews at a session. The normal mode would increase usage of the software by making studying easier - only a few things to learn at a time. Not only that, this normal mode should be made up of at least 30% of familiar cards. This re-enforces old ideas and sandwiches new cards to make learning less difficult. Add an always on top option to the window of the application. Simple and easy. So you can explore with the web browser words or anything in the same time you add them. Support for using close deletion within close deletion. A cofactor is an atom or molecule essential for the action of a large molecule, e.g., heme in hemoglobin, magnesium in chlorophyll. Solo metal ions are regarded as cofactors for proteins, but not as coenzymes. Often cofactors are a […]. Switch to a Foreign language when typing in Answer field. When adding or editing a card, we switch from Foreign to Native language many times -- while 'optimizing' the card. Assign a Foreign language [user chooses it in Settings] to the Front side of Cards. That way, as one 'clicks' on the Front side - the Foreign language is activated. Should work in the Browser, too. > The stacked bars show the total cards in my “deck,” broken down by rating. 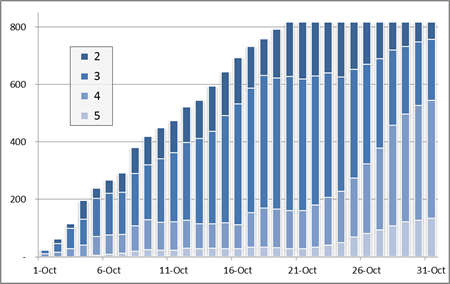 As you can see, I was adding 20-80 cards every day for twenty days, about a chapter a day, and when I finished the book, the last ten days were just spent reviewing cards. You can see at the end that according to my own target of 4 or better, I had learned well over 500 new German words by the end of the month. And I knew these words outside the context of these drills, recognized many of them in other settings, and even managed to use a few in everyday conversation. > Not enough feedback, or not the right kind. This is a critical one. Notice that the graph I showed you — progress over time — does not come standard in Mnemosyne. I had to record that data every day in Excel and make it myself. You can get “snapshot” charts in the app, but not time-oriented ones, which are a better motivator. growth of 4/5 cards over time. My number of cards per day can sometimes vary a lot (say, from the 40s to the 80s). It would be nice to have Mnemosyne, on request, adjust some cards' schedules so that the upcoming schedule is more smoothed out. I assume that it would start with the best-known cards since those are the ones who would be least affected by moving the next repetition by a day or two. Similarly, if I know that there is a day in the future that I won't be able to study, it would be nice to be able to mark it as a "holiday" and have Mnemosyne redistribute its cards to nearby days, rather than do a bunch of catchup afterward. Preview of the pictures of a card while still being in the "edit" mode. Without pressing "preview"
Working with flashcards featuring a lot of pictures, it would be nice to have an option for turning on an immediate preview of images while the user is still in the "edit card" tab.So no need for pressing "preview" as in preview mode of course you cannot work on the possible text you want to wrtie below your images. Support for using already existing cloud services (dropbox, google drive ...). Then both computers don't have to be online when syncing, and you'll never have to think of syncing manually. Perhaps it could build upon the existing sync. function in mnemosyne, instead of syncing directly to another computer, pull the data from an folder. Check the folder each time mnemosyne starts, update the folder when mnemosyne quits. In may 2012 David Haas suggested to have Ctrl+B functionality for bold text. SInce he did not put it in, as Peter advised, I'm doing it - bcs I need it for EVERY english vocab card. Meanwhile, I will try to lear how to make keyboard macro, as David mentioned. Currently it is only possible to view grades for one single sub topic at a time which does not really give you a good idea of how you are progressing. Also it could take you a long time to view all your grades; if like me you have lots of topics and subtopics. I think it would be useful to be able to see the grades of 'active cards only'. This way you can see how you are progressing on those cards which you are working on right now. Microsoft Office OneNote allows Screen Clipping by Win+S to take a screenshot of a certain section of your screen. I need to add sound to many cards, and I can do it by find and replacing some words to add the path of the sound files to the cards. Also I did some mistake in writing punctuations which I could correct all of them by find and replace. Right now I can't do it by exporting the database to another text editor because on import my learning process will be lost. Add an option to turn off the warning display about "Learned 15 cards"
Add an option to never show the warning about learning 15 cards in a day. HTML tables are being displayed with a specific default. The table is justified to the left of the card and the individual cells are centered. This is different than version 1.7, and work well with me. I have a lot of cards with tables, so I'd like to avoid having to go through each card and add tags to get a certain table style. There should be a way to specify to Mnemosyne to display all tables in a default way (unless, of course, the HTML table tags contain specific formatting)? This might be taken even more generally as some sort of a "default style" menu which acts something like a CSS (style sheet).